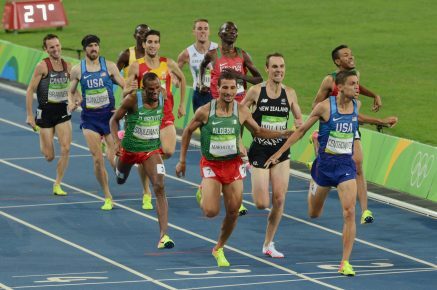 21st August 2016 – Over 100 years have passed since the USA was able to celebrate a men’s Olympic 1500m champion but the waiting is finally over as Matthew Centrowitz (USA) won an enthralling final in Rio de Janeiro. A pedestrian early pace saw Matthew almost reluctantly head the field but it was to be a position he would never relinquish. Try as they might his nearest challengers from Kenya, Algeria and New Zealand made their bids for glory but showing the turn of foot that already brought him the World Indoor title earlier this year Matthew clocked 50.62 seconds for the final 400m and held them all off to take a famous win. In the women’s 1500m Shannon Rowbury (USA) ran a great race and just missed out on a medal over the final few strides. Shannon placed fourth having run under 2 minutes for her final 800m. In the 800m Michael Rimmer (GBR) and Winny Chebet (KEN) both made it to the semi-final stages but were not able to progress on to their respective finals.